_This is the story of Aymestrey School, a boys' preparatory school in Worcestershire, UK. It was started by the Asterley family, in 1909, as Aymestrey House in Malvern Link. 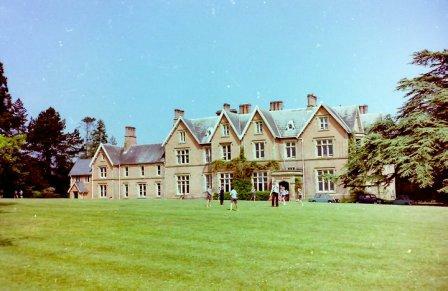 In 1922, when it had outgrown that building, the school moved to Crown East and became Aymestrey Court. By the time Hugh and Gill Griffith took over in 1966 it was Aymestrey School and it kept this name until it closed in 1998. A place of learning, certainly, with a fine record of examination results and scholarships. A place where we learned to behave … where we learned to respect and were treated with respect; where we were taught the importance of standards and were encouraged, in lovely surroundings, to appreciate the wonder and beauty of nature and the countryside; where we learned about music and art and carpentry and discovered the treasures of literature. And with it all we seemed to learn how to live simply. Fishing by the lake in the summer, climbing the lime and playing croquet on the lawn were all activities I used to enjoy. Part of the essence of life at Aymestrey was being able to play (on trust) unsupervised in the grounds, which taught us self-discipline and self-reliance. They were some of the happiest years of my life. _The five years I spent at Aymestrey was an experience of such positive intensity ... that it resides always in the forefront of my mind and remains, for me, unrivalled as a source of image, memory, speculation and gratitude. I sometimes think that Aymestrey was an entire universe, detached and self sufficient, set in an Elysium of robust rural perfection, but which contained (as all good universes do) both heaven and hell. It could be hellish when Dan was dissatisfied either with one personally or with some aspect of the school's performance. I will never forget the repeated marching up and down the drive when the Scout church parade marching standard didn't meet with Dan's approval. ... Dan's approval was the key to everything.